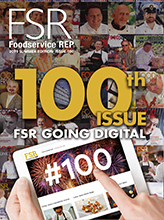 Foodservice Gateway » Ingham make end of year catering easy! With term four now upon us and the end of year fast approaching, the poultry professionals at Inghams have some great ideas for event catering. These flavoursome and attractively presented meals have been chosen for their ease of preparation and are ideal for speech nights, Christmas staff or P&C functions and much more. The recipes showcase Inghams’ turkey products range, including Oven Roasted Turkey Buffé (lightly marinated and made from premium whole turkey breast with first wing joint attached, available in regular or Premium varieties), Half Breast (deboned and available in oven Roasted and Sweet Herb & Mustard), Oven Roasted Double Breast (marinated and seasoned), Breast Roll (made from natural whole breast fillet with the skin removed, then lightly marinated), Breast Supreme and Healthy Select Turkey Breast. Method: mix all ingredients except turkey in a bowl. Place on to a serving plate or divide on to individual plates. 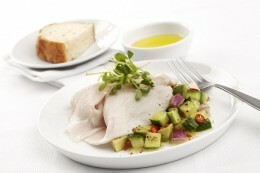 Top with Ingham Oven Roasted Turkey Half Breast for a great salad or buffet item.